Often times, the news reported by major media outlets focuses on a crisis or calamity years or even decades in the making. Take for instance the drinking water crisis in Flint, Michigan. If citizens understood the history behind the decision to draw water from the Flint River or were better informed about the changes (or lack thereof) in infrastructure that caused the lead contamination, could the crisis have been averted? A new, collaborative journalism project in Wisconsin called WisContext is looking to fill that information gap through accessible and informative guides, news reports, and explanatory resources that directly address the issues of today that may become the crises of tomorrow. In the case of Wisconsin water quality issues (of which there are many), the WisContext website features information ranging from data on arsenic and nitrate pollution to updates on the Department of Natural Resources lead pipe fund and expert perspective on water quality and quantity in Wisconsin. Water quality reporting is just one of many topics covered by WisContext, which was developed in partnership with the University of Wisconsin-Extension, Wisconsin Public Radio, and Wisconsin Public Television. Launched in June 2016, WisContext.org features a variety of articles and videos that are designed to help readers understand the local impact of statewide and national news items, breaking them down and explaining what they mean for a city or county. 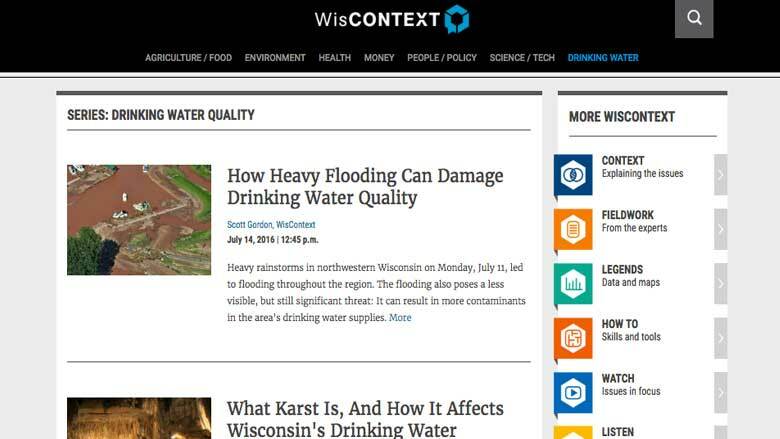 Kristian Knutsen, the managing editor of WisContext, describes the focus of the project as a, “deep dive, explanatory approach to reporting on the issues that matter,” which gives news time to develop and connect to broader, statewide topics. In addition to diving deeper into news items from WPR and WPT, WisContext offers a series of informative guides designed to help readers take action. One such guide explains drinking water standards and tests that should be conducted to ensure well water meets state standards for bacteria, nitrates, and other elements, equipping readers with knowledge and information necessary to understand if their families are at risk. The WisContext project is part of a renewed effort by all partners to better use the skills and knowledge of Wisconsin-based experts in various fields to improve the resources and information available to state residents. One of the unique aspects of the site is Fieldwork, a section that shares research and findings from local experts to supplement existing reporting on current news. Scott Gordon, WisContext associate editor, sees the new site as an opportunity to digitally connect the expertise and resources of UW Extension with a broader audience that may not be reached by traditional public radio and television reporting. Too, WisContext encourages other news outlets to reprint any content with attribution to facilitate greater public access. And, perhaps, a little more appreciation and understanding will make all of us better neighbors.